Tell us a bit about your upbringing, where did you grow up ? what was life like for mini Tessa? Ah you’re cutting straight to the core with the first question. I was born in Cairns and grew up on a farm in Childers. My upbringing was pretty brutal. My father is a Vietnam War veteran so let’s just say living with him was hell on earth. My mother and I ran away from him when I was 10 years old. My whole life revolved around horse riding, mainly show jumping, and dancing. My mother was a dance teacher so I was trained in jazz, tap, ballet, hip hop and contemporary from the age of 3. I was constantly competing at horse shows and dance competitions and had to complete up to 5 major dance exams every year. It was pretty intense. My mother taught dancing in Childers and Biggenden nearly every day of the week. I wasn’t able to stay at home when she wasn’t there so even if I didn’t have dance lessons I would always have to stay in town after school. Being unsupervised, I would run amok with my friends, for hours into the night. This is how I wound up at skate parks I guess. When I was about 15 I met two dudes, both called Chris, who rode BMX so I tried that out for a while without my mother knowing. I ended up running away from home when I was 16 and moved to Bundaberg without telling a single person at school or any of my friends. I just went missing. I enrolled myself in this lovingly ghetto high school called Kepnock and worked full time hours in hospitality to stay alive. It was pretty cool not having to answer to anyone. I used it as an excuse to cause trouble in my Chemistry class all the time. My teacher would threaten to call my parents and I would tell him I didn’t have any which would shut him up. I ended up hanging out with my BMX friends at the Bundaberg skate park a fair bit and that’s when I noticed skateboarding. I decided I had to be friends with the dudes who skated there. I must have been pretty gutsy at the time to start talking to them when I was this 16 year old little rat. I always owned a really crap skateboard though I never thought I could actually learn to skate. I thought it was magic or out of bounds to me. I used to drive around with some of the dudes and go to street spots to take really bad photos on a compact digital camera. I had no idea what I was doing but I felt free and we were all having fun. A lot of those dudes have moved to Brisbane now and I see them pretty regularly, which is cool. How did you get in photography generally? and then how did you get into shooting skateboarding ? I’ve only really been shooting skateboarding properly since May this year. My friend Donny who runs Drawing Boards asked me to come along and shoot this demo his team were doing at the Big Pineapple Festival. That day actually changed my life. I had met a couple of the dudes on the team before as I had taken some quick snaps of them for my zine, withflaws., though a combination of hanging out with everybody for the day, meeting fresh, talented people and enjoying the chill vibes really made me want to be a part of the community. I ended up hanging out with Joel Wilshere and James Briody (who were also at the demo) every weekend after that festival. I would take my camera to spots they went to in the city with filmer Stu Fog and a bunch of other skaters. I had no idea about skate photography. I’ve been shooting photos for years now but skate photography is different. I think it is possibly one of the most challenging forms of photography. I gained more knowledge about photography and my gear in one month than I had in six years. I absolutely thrived off the complexity of getting a good shot. The amount of things you have to think about really gets your mind working, at least when you’re first starting out. I’ve always wanted to be this intertwined with skateboarding but I feel something clicked this year. It was the right moment. Photography can be a relatively expensive pursuit, how do you fund your passion? It generally takes me ages to get gear I want. I’ve had to learn to be extremely good at saving over the years. I used to earn money from a lot of band and portrait shoots so I always spent that money on gear. I bought a new fisheye recently, I’d been looking for this particular one for ages because Canon had stopped producing them. The money for that was actually saved from my university scholarship money that I am granted once a month. I read on your website that you used to work for the well re-knowned Spring Studios in London, tell us a bit about your experience living and working in London. I moved to London because I wanted to be a photographer and writer. It made sense to me at the time. All of the best music magazines are published there. London is such a brilliant city. It took me about a year to settle in though. It’s a hard city and can be extremely lonely, though I feel I grew, as a person, there. I knew absolutely no one when I moved. I didn’t know much about skateboarding at the time but I somehow made my way to the skateboarding landmark of Southbank. Skateboarding is so amazing for making friends. It was probably the best move I could have made. Shortly after I got kicked out of my flat in South London. Literally thrown out. The dude I lived with actually threw my belongings on the footpath and then threw my rent money at me, which was probably a good thing looking back at it. I slowly made my way into the music scene from there. Putting on shows in north and east London. Fashion photography seemed to be the next step for me. A moneymaker. I applied for a job as an assistant at Spring Studios and went through a rigorous training course. That place was gnarly. Our shifts started before first light and sometimes went until the next morning. The jobs that go through that place are worth so much money they don’t care how much over time they pay for a studio. There were constantly paparazzi out the front so we used to have to chaperone people through the back gates. I remember Apple shot a test campaign there for an iPhone that was coming out. It was only a test and it lasted a number of weeks and a whole floor was blocked off in the massive warehouse that is Spring Studios. Spring has it’s own fine dining restaurant. The place is insane. I guess it’s a good example of what London is, well at least to me. It’s the pinnacle. While slaving at Spring I was also doing freelance work and making friends with photographers at NME and with labels such as Warner. That’s how I finally got a photo published in NME (even if it was of the Wombats). It was a dream come true. Though then my visa ran out and I came back to Brisbane. I felt like I had been robbed. For years after that I was still chasing the dream of living back in London. I’m pretty content now. 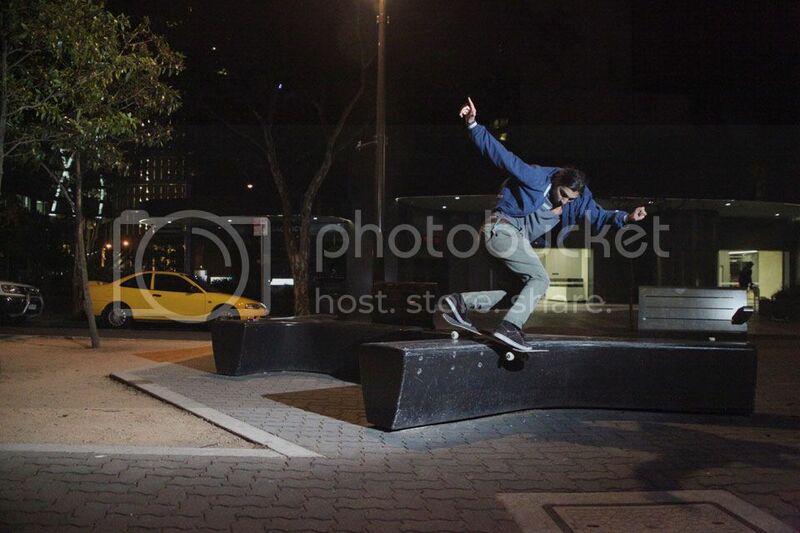 This year is the first time I’ve actually enjoyed living in Brisbane and I know it’s all due to skateboarding. You shoot a lot of bands and are also passionate about music, do you play music? I’m the vocalist in a scramz/miscellaneous/fun band called KIRI (https://www.facebook.com/apeykiri). We just got back from tour, which was amazing. We have a 7” coming out at the end of November. I also play drums in a post punk band called Pink Fancy (http://pinkfancy.bandcamp.com/releases ). We aren’t really doing much right now though due to a line up change. Next year we’re looking to be back on our game. I love going bush and shooting landscapes. Adventures while camping are always fun. For personal photography I use my Canon A1 film camera. I love shooting film and there isn’t really an opportunity to do that with work based photography due to the high turn around that is required. The quality and tangible aspect of it plus not knowing 100% how it’s going to come out is great. You’re jetting overseas at the end of the year to go on a South American adventure! Why South America? What do you hope to experience during your travels? I think South America was just next on the list. I’ve put it off for ages because it’s the most expensive place to fly to from Australia. I’ve turned it into a bit of a skateboarding trip actually. 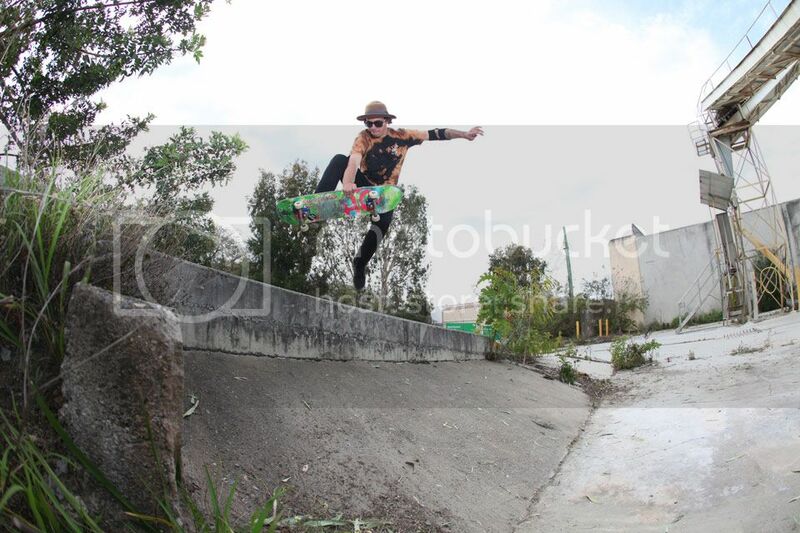 I’m super amped to find the Pura Pura skatepark in Boliva. I watched this documentary (https://www.youtube.com/watch?v=N0ZKykvnEoM) on the building of it and it made me really excited to try and skate it. It’s the highest skate park in the world; apparently walking in high altitude is hard enough let alone skating. I’ve now mapped out at least one or two cities with a skate scene in every country I’m going to. Besides skateboarding I’m determined to find a shaman in the Amazon and take ayahuasca. I’m hopefully going to stay on a coffee farm in Columbia as well. I’ve organised to hike the Inca Trail and see Macchu Piccu and I’m going to try and climb a volcano somewhere as well, maybe Chile. Everything is pretty loose. I just have a bucket list I need to tick off. Also I’m going to do my best not to get mugged or kidnapped. With skateboarding photography, you have to really trust your photographer, nobody wants to throw themselves down 20 stairs only to find out the photo didn’t quite work out, how do you build this trust with skaters? Do you ever get nervous that your going to blow it? I get nervous every time I shoot because I know how much is at stake. I think you need to be confident within yourself and then the people you’re shooting will be confident that you can nail it. I think it’s easier to build trust if you’re actually out skating with the people you shoot on a daily basis and you then have a really good rapport with them. The more you understand skateboarding the easier it gets to shoot it. If they see you out skating everyday and know how passionate you are about it then they have more trust in you. Communication also has a great deal to do with it. I think it’s important to remember that without the person doing the trick down the 20 stairs then you won’t have a photo. You need to understand what they want from the photo, know how to make it look as gnarly as it is and also respect how they want to use the photo afterwards.